October 24, 2017 (Edmonton, Alberta) – Rohit Communities and Habitat for Humanity welcomed a mother and young daughter into their new townhome on Monday, October 23rd as dignitaries and staff members from both teams watched on. The ceremony included words from Alfred Nikolai, President and CEO of Habitat for Humanity; Rohit Gupta, President of Rohit Group; Thomas Dang, MLA for Edmonton South West; and the new homeowners. Rohit Communities has a strong history of partnership with Habitat for Humanity. Earlier this year, over 30 volunteers from Rohit Communities and their partners rolled up their sleeves to join The Jimmy and Rosalynn Carter Work Project to help 75 families gain home ownership in Edmonton. Previously, Rohit Communities donated homes to families in Windermere, as well as another in Leduc. “We have a continual focus on working with families to access safe and attainable housing,” stated Rohit Gupta, President of Rohit Group. “For us, we see home ownership as a major positive step forward that can create positive ripples throughout not only their life, but also those of the community around them”. Essential Allard, the townhome development the family now calls home, was selected not only because of the location in an established community but also because of it’s proximity to a new school. Rohit Communities is the foundation of Rohit Group of Companies, a diversified real estate organization in Western Canada. Rohit Communities is a leader in home building due to efficient use of space and attention to architectural design. Rohit has received multiple awards at the local, provincial and national levels, including winning Edmonton’s Home Builder of the Year four times. They have also been presented with the Leadership Award at the Awards of Excellence in Housing for four consecutive years. In 2015, Rohit Communities expanded into the Regina and Calgary markets. 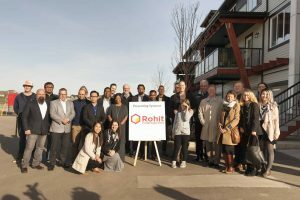 Rohit’s commitment to building innovation is evidenced by their award-winning duplexes and townhomes.